Come out for a fun romp in the green hills east of Gilroy! 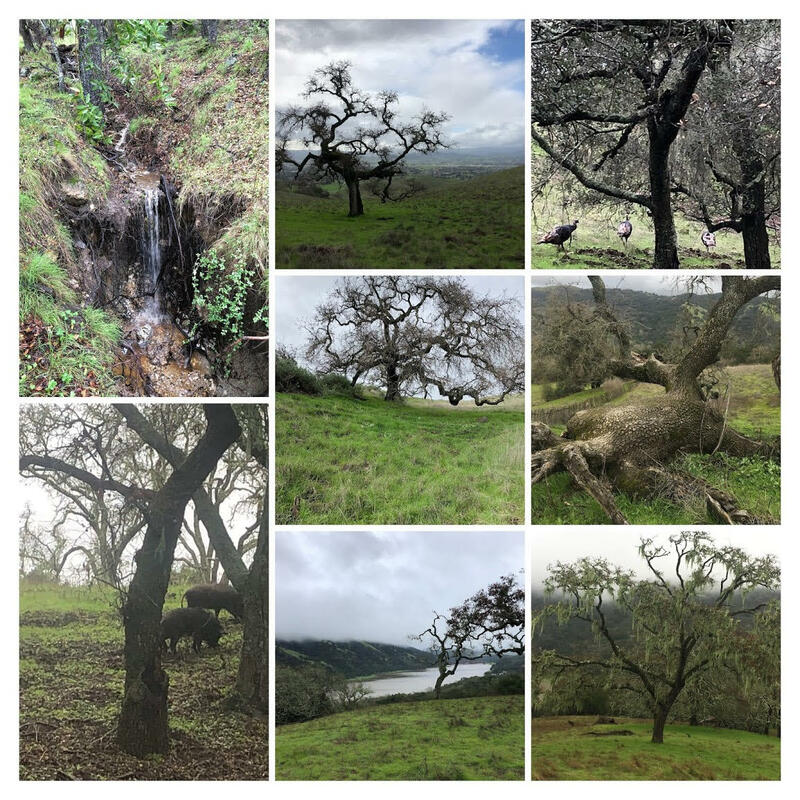 Coyote Lake/Harvey Bear Ranch Park is truly gorgeous this time of year, and movement is easy in most any direction. The ground is soft, the grass is short and green, and the forests are nice and open. It feels a bit like a video game or movie version of nature. Did I mention it's beautiful and fast? The White and Yellow courses give you awesome views of the Santa Clara valley from the ridgetop. They do have a bit of climb, because that's where the trail loops are. Yellow provides a number of shortcut options, and has one off-trail section. There may be no better place to try going off trail​—​give it a shot! The advanced courses contour a lot, and the climb isn't high by Bay Area standards. There is nothing too steep locally, depending on route choice (well, there is one sort of unavoidable stretch on Blue). I guess the distances are a tad higher because of this, but you might still consider going up a level here if you've been thinking about it. Beginners should be aware that the course lengths shown are the cumulative straight-line distances between controls. Your actual distance will be somewhat longer. For a rough estimate of how far you will actually go, mentally change "km" to "mi" (e.g., for a "2.3 km" course, you might travel about "2.3 mi"). The climb numbers represent the amount of ascending that would be done on the "optimum route" (in the Course Setter's opinion), without regard for any descending. There is a 300 m walk to the White, Yellow, and Brown start area. There is a 1.1 km walk to the Orange, Green, Red, and Blue start area. Limited amounts of water are available on the courses. The open areas uniformly have short, green grass. Apparently the course area was all grazed down last spring. I guess the new grass will grow up a bit in the next couple weeks, but it'll probably still be easy to run. The forests are open, with the trees far apart and usually with very little undergrowth. Occasionally the forest is mapped as light green; these areas are still very fast, but the trees might be a bit closer together or bushier. In places there is light undergrowth in forests, sometimes mapped and sometimes not. I found the slash to be the least trustworthy feature of this excellent map. There is poison oak here and there, mostly in small- to medium-sized thicket or vine form. This PO is easily avoided. However, there are a few of the isolated short individual plants in some places in the forest, which you might encounter, and the leaves may well be budding out by early February. I would say bring a change of pants to be safe, in case you end up brushing against it a few times. I visited during a dry spell, and again just after a small rain. The second time, it was muddy in places on trails. Cleats are always a good idea, but especially if it's raining or has been raining a lot. That said, the ground will almost certainly stay nice and soft, unless the rain goes away completely between now (Jan. 15) and the event. Many of the mapped point features are deadfalls, indicated with a brown ×. These represent fallen trees (not rootstocks)​—​sometimes just the trunk is left, and in other places you'll find the trunk plus the jumble of branches from the canopy. Of course, some deadfalls didn't make it onto the map. The control description for these fallen trees is an X, even if a rootstock is not apparent in the terrain. There are also a few green × symbols on the map, representing standing dead trees (i.e., stumps or snags). There is a control at one of these, clued with "ruined tree". There are also bushes, clusters of bushes, and/or small bushy trees represented by the green-dot symbol​—​where I used these for controls, the clue is "thicket". Some of the cow paths are pretty significant and maybe should be mapped, but mostly aren't. Other than rare short sections, mapped paths and roads are official park trails. There is one possible barbed-wire fence crossing on Orange, Green, Red, and Blue, depending on your route choice. Roll under! Deer and pigs abound. There is at least one, and maybe a couple, "sounders of swine" in the area, a "passel" of 15–20 "hogs" including a "drove" of little ones. (Yes, I looked those terms up.) They grunt and run away when they hear you​—​I've heard they can turn aggressive if they feel threatened, but I must not represent much of a threat. There are cattle that might be hanging out in some of the course area; I saw a bull, so don't run aggressively at him.